Universal Robots: Packaging and Palletizing by Collaborative Robot Arms - Allied Automation, Inc. Streamline your packaging and palletizing operation to be simpler, faster, and more efficient. Relieve workers from repetitive work and heavy lifting by automating your packaging and palletizing with lightweight collaborative robot arms. Automation helps you combat the rising costs of new product packaging and shortened product life cycles. The intuitive, easy-to-program interface makes the UR robot arm perfect for small-volume productions as well as highly repetitive tasks. You can reprogram and redeploy the robot as needed across your operations. If your work flow changes, the packaging or palletizing robotic arm can be deployed quickly and easily in new constellations due to its small size and lightweight design. 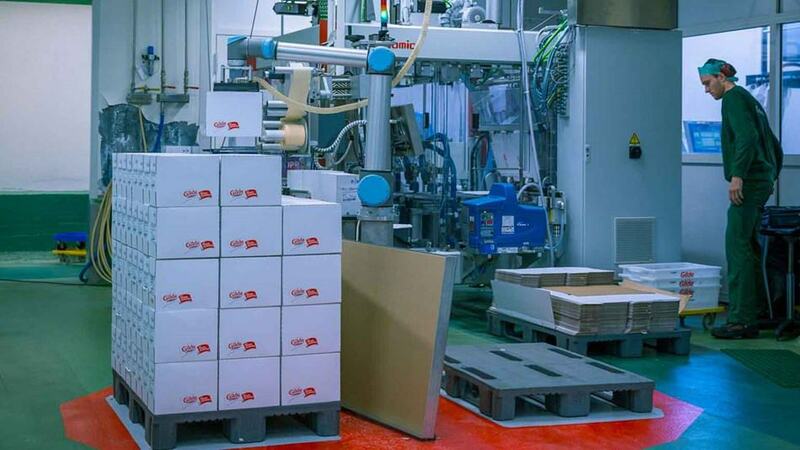 UR robots can be used in most packaging and palletizing applications. Our space-saving robots can also be reprogrammed quickly and used with many different machines. With robot arms from Universal Robots you can free up your work force in order to do more important tasks. Lower your operation costs. Universal Robots gives you all the advantages of robotic automation, with none of the traditional added costs associated with robot programming, set-up, and dedicated, shielded work cells. The average payback period of 195 days is the fastest in the robot industry. During busy seasons, UR robots can operate 24/7, delivering non-stop productivity to your business. They can be deployed and re-programmed as needed across tasks and applications as often as required. All collaborative robots from Universal Robots are certified IP-54. They will need protection when working in corrosive liquid environment. Norwegian meat producer Nortura needed to optimize palletizing, but with limited floor space and a tight budget. A UR10 robot with a ceiling-mounted vision system provided a cost-effective and high-performance palletizing system in one-fifth of the space typically required. If no pallet is present, the floor space is available for other processes.